If your teeth could talk, what would they say? Greetings, from all us at Times Square Dental! We hope you’re enjoying the summer and good oral health. Today, our team of dental professionals here in Boise, ID want to talk to you about how your teeth speak to Dr. Hastings, Dr. Dial, and the rest of our trained staff. When you come in for a routine dental cleaning and exam, we can gather certain things about your life and your habits without you having to say a word. That’s because so much of what we do on a daily basis can be reflected in the state of our teeth and gums. So let’s look at a few of the things your teeth might say to us about you, if your teeth could talk! What Can Your Teeth Tell Us? Many times, if we find things like cavities, signs of decay, enamel erosion, or plaque and tartar buildup, it can be an indicator of a diet that’s high in sugar or acidity. For starters, there are all kinds of bacteria living in your mouth. When the bad bacteria finds the sugar that’s left behind from your food and drinks, it will attack that sugar with a ravenous hunger, and creates plaque. If the plaque isn’t adequately cleaned away, it can harden into tartar on your teeth, or around and under the gumline. This is what leads to cavities and gum disease. We can also see signs of a diet that includes acidic foods and drinks by the state of your tooth enamel. Signs of erosion show us that you might be eating and drinking things that have high acidity levels that eat away at your enamel and create easy access to the plaque and tartar we just talked about. If you’d like to know more about how diet affects your oral health, make sure to ask us about it at your next dental checkup! Often times, the color of your teeth can suggest certain lifestyle habits. Smoking or using other forms of tobacco, or drinking coffee or red wine, for example, will leave stains on your teeth over a period of time. We do offer cosmetic treatments like professional teeth whitening that can help to reverse the effects of lifestyle and brighten your smile. But we definitely want to encourage you to stop habits, like using tobacco products, that will not only make long-term whitening difficult, but that will cause irreversible damage to your oral and overall health! The American Dental Association recommends brushing your teeth twice each day for two minutes each time. They also say you should floss at least once every day. But studies show that only about one in five Americans actually floss! We can usually tell during a checkup if you’re staying on top of these daily hygiene practices. 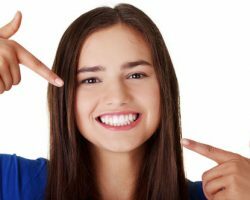 In some cases, a patient might show signs of decay or gum disease despite a very diligent oral hygiene routine at home because there are other factors that can contribute to dental problems. But for the most part, if you aren’t keeping up with brushing and flossing to wash away and dislodge food particles and other debris from your teeth and gums, it will eventually show. Your Teeth Tell Us You Need Our Help! We’d like to think that if your teeth could actually speak for you, they’d tell you to trust our team at Times Square Dental for all your dental needs. We have a caring staff of highly-trained professionals who are dedicated to helping you achieve a healthy, beautiful smile. Choose our team in Boise, ID for your next dental cleaning and exam. Call Times Square Dental at 208-278-1069 or fill out our convenient online form to schedule an appointment.